The National Aquatics Centre, home to all the diving and swimming events, is one of the star attractions of the Beijing 2008 Olympic Games. Seating 17,000 spectators and has a total floor space of 70,000m², the ‘Water Cube’ will be used both during the Games and afterwards as a multi-purpose leisure and elite swimming centre. 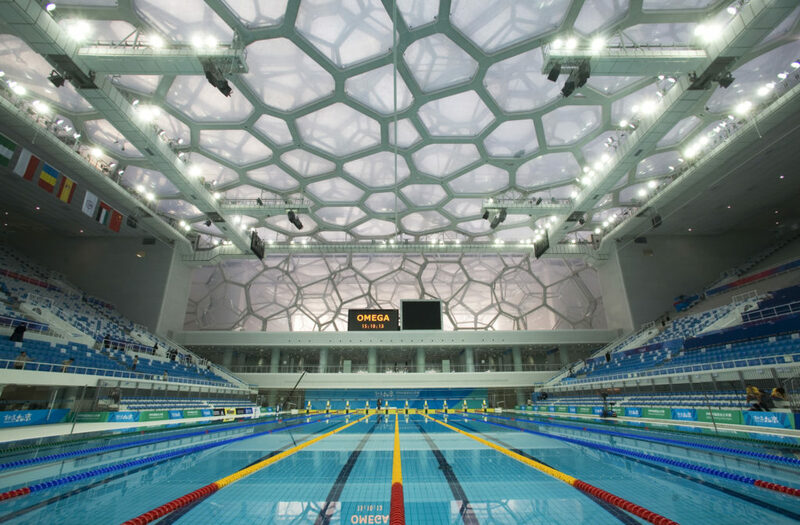 In July 2003, the consortium of Arup, architecture firm PTW, the China State Construction and Engineering Corporation (CSCEC) and the CSCEC Shenzhen Design Institute (CSCEC+DESIGN) won the international design competition for the National Aquatics Centre for the 2008 Beijing Olympics. The team based the design on the common natural and three-dimensional pattern: the way that soap bubbles form and interconnect to fill a space in the most efficient way. 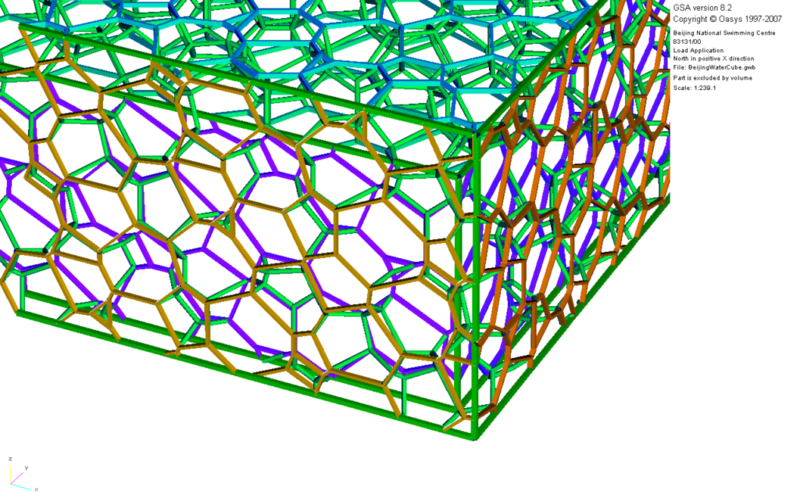 The structure of the building is a 3D vierendeel space frame 176m * 176m * 29m high based on a geometric cell made up of 12 pentagons and two hexagons that is 3-dimensionally repeatable without leaving any empty spaces. All walls are approximately 3.6m thick and the roof zone 7.2m deep. The final structure is comprised of 22,000 tubular steel members connected by 12,000 nodes. Although the organic design of the building’s structure appears random, the unique geometry is actually highly repetitive and buildable. The resulting structure is very ductile and ideally suited to the seismic conditions found in Beijing. Vector Special Projects won the contract to supply the Ethylene Tetra Fluoro Ethylene (ETFE) foil cushions that form the cladding and employed David Dexter Associates (DDA) to analyse and design them. DDA brought in GSA to do the work: they realised that nothing else would do. 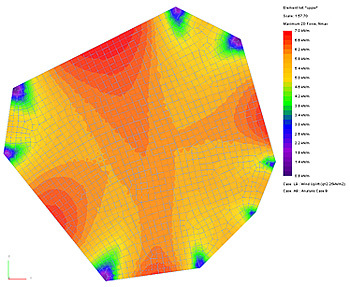 DDA imported the bubble geometries direct from Arup’s 3D fabrication model into GSA. This maximized the accuracy of the analyses and subsequent fabrication of the cladding. The large cushions are actually in three layers (outer, middle and inner), with their contained air pressurised to 200pa, giving an effect similar to a cavity wall. The middle layer is mostly there for thermal and acoustic insulation, but also acts as a safety measure in the unlikely case of the outer later being punctured. While DDA believe that damage from bird strikes is unlikely to pierce the ETFE foil, there is a perceived risk from flying debris in the typhoons that Beijing experiences. The pillow pressures are maintained by active pressure monitoring. If a roof pillow did collapse then water ponding could be a problem and would have to be dealt with by the maintenance crews. The pillow pressure will be sufficient for snow loads without snapping through. The form finding of the small cushions was straightforward, as they were simply cut to fit the openings and inflated to the operating pressure of 200pa. This caused the ETFE to yield and deform plastically, thus finding the final shape organically. With the large cushions, this method is not a possibility, as they would have to yield beyond acceptable limits. Form finding was thus necessary to find the initial geometry of the foil and thus prevent overstressing. DDA used GSA’s soap-film method, which finds the minimum surface area between boundaries, combined with a surface pressure to push the membrane out to the final position. GSA can also form-find using the force-density method (typically used for cable nets) and by forcing permanent large deflections. All three techniques use dynamic relaxation algorithms. Once DDA had completed the form-finding operation, the next stage was to use non-linear analysis to ensure that no foil was overstressed under the service loads, which included internal air pressures, external wind and snow. To ensure that the analysis was accurate, the ETFE supplier, Vector, supplied the material properties and RWDI conducted wind tunnel tests to measure the aerodynamic forces. As the ETFE foil can only carry tension forces, all external loads are actually carried by the surface away from application. In other words, when the wind blows on the outside, the foil membrane on the inside resists it, with the load transmitted through the cushions by the internal air pressure. This reduces the prestress in the outer layer, but it should only go slack under extreme wind loads, such as are likely in a typhoon. Under normal wind loads, the outer layer will remain taut. The result of this analysis was a foil thickness requirement for the fabricator and connection forces onto the supporting steelwork. Once the form-finding and analysis were complete, DDA handed the results to Vector for fabrication. As the ETFE foil comes on 1.7m wide strips, any cushion larger than that require welded seams. The cutting patterns for the small cushions were straightforward, as these yielded into their final shape and Vector could keep the foil strips rectangular. For the large cushions, they required a patterning exercise to derive the correct curved edges to the foil strips so that when they were joined, the overall membrane would already be close to the final curvature. When the layered cushions were complete, they were shipped to Beijing and erected into place. Once in-situ, they were then inflated to their operating pressure of 200pa. The pumps will continuously maintain the pressures for the operating life of the cladding, with the actual pressures monitored for excessive leakage. 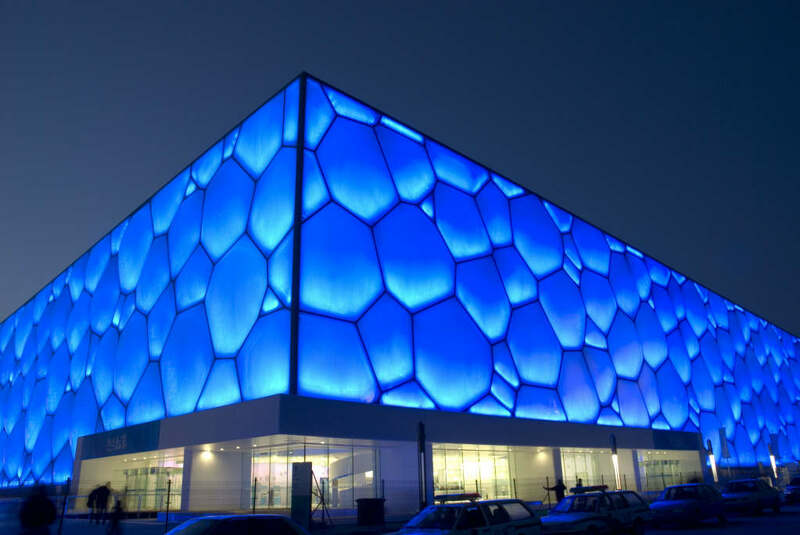 "We chose GSA to design the 'Water Cube' ETFE cushions because it was well respected and accepted. 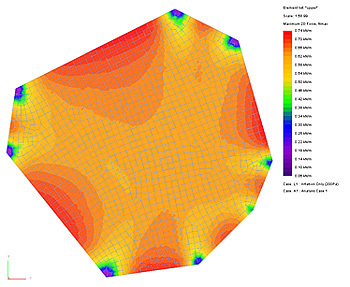 The intuitive interface was very useful for extracting results such as the principle stresses. It was the best choice for the job."